Coverage: Live on BBC One, live commentary on BBC Radio Scotland, Radio 5 live sports extra, BBC Radio Wales, BBC Radio Cymru & BBC Sport website and BBC Sport app, plus live text commentary. Scotland head coach Vern Cotter has made only one change for the Six Nations trip to Wales on Saturday, with Duncan Taylor in for Matt Scott. 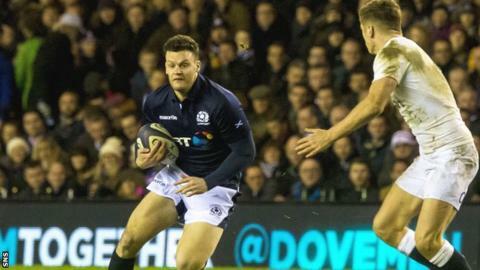 Centre Taylor came on for Tommy Seymour for the final 15 minutes of Scotland's 15-9 defeat by England last Saturday. The forward pack is unchanged, with Alasdair Dickinson, Ross Ford and WP Nel in the front row. Cotter's team head for the Principality Stadium seeking to end a run of eight consecutive Six Nations defeats. "This is a vote of confidence for the players who lost to England five days ago. Vern Cotter said then that Scotland would have won the game had they taken their chances. In selecting the same side minus Matt Scott through injury he's showing confidence that they can do just that in Cardiff and secure a first win there for the national side since 2002." Wales drew 16-16 in Ireland. Warren Gatland's side have won the last eight games against Scotland. Scott injured a thigh in training on Wednesday and, with Taylor's promotion to the starting XV, Sean Lamont comes on to the bench hoping to add to his 101 caps. Taylor, 26, signed a new deal at Saracens last month having joined from Bedford Blues in 2011. The match in Cardiff, where both teams are in favour of the stadium roof being closed, will be his fifth start in 14 caps and his first since the 2014 summer tour win over USA. Injury has curtailed his involvement with the Scotland team over the past two seasons. With Taylor the sole change to the starting line-up as he comes in to partner Mark Bennett, Cotter goes again with a back three of Stuart Hogg, Sean Maitland and Seymour, and the backs are completed by Finn Russell and captain Greig Laidlaw. John Barclay, John Hardie and David Denton form the back-row, and brothers Jonny and Richie Gray are at lock, behind the all-Edinburgh Rugby front row. Cotter insisted the squad would be looking to put things right against Wales after a disappointing Calcutta Cup defeat. He said: "This group have worked exceptionally hard this week to improve their accuracy under pressure after a frustrating opening game against England. "We created opportunities that could have been capitalised upon and converted into points. "As a team we know we can perform better and believe we're capable of making improvements all over the park. "We know that Wales in Cardiff will not be easy but our focus is on improving our attacking and defensive mindset." Scotland: Stuart Hogg; Sean Maitland, Mark Bennett, Duncan Taylor, Tommy Seymour; Finn Russell, Greig Laidlaw (captain); Alasdair Dickinson, Ross Ford, WP Nel, Richie Gray, Jonny Gray, John Barclay, John Hardie, David Denton. Replacements: Stuart McInally, Gordon Reid, Zander Fagerson, Tim Swinson, Blair Cowan, Sam Hidalgo-Clyne, Duncan Weir, Sean Lamont. Read more on Will Scotland's baby steps be enough to stop brutal Wales?